Greetings, dear readers! The weekend is SO CLOSE, and I hope you have something fun planned! As for myself, I've gone into overdrive trying to tie up loose ends before I head out to Brooklyn for Polish Con on Saturday. I'm still trying to decide how I want to do my nails, and I leave tomorrow morning. At least I have a long flight that I can sleep on if I'm up late tonight! With Polish Con so close, I really wanted to get this posted beforehand. While the event is predominantly geared towards indie nail polish, polish fiends will also be able to get their hands on polishes by JulieG as well! Sold by Jesse's Girl Cosmetics, this brand can also be found at select Rite Aid stores. Just in time for spring, Jesse's Girl Cosmetics is currently having a promotion for three different trios of Julie G shades! The trios consist of Core Collection colours and a few Cruise Collection for added measure. While each polish retails for $3.99, these trios are only $10! Now that's a great deal! I have the pleasure of swatching and reviewing all three trios so brace yourself- this is one photo-packed post! Let's check them out! I'm swooning over this gorgeous colour! New to the Julie G lineup, Tropical is one of my favorite colours from these trios! The first two coats were a little uneven and patchy, but it evened up nicely with three coats. Shown with three coats plus top coat. This pretty pinky-purple is sure to make your dreams come true! Dream in Pretty is just that: pretty! It's not a colour I am personally drawn towards, but the colour is lovely! It's definitely one of those shades that will make you stare at your nails and try to decide "Is it pink? Is it purple?" I know I certainly pondered it for a little while! The formula was nice although it is a bit thinner than the polishes I normally use. I used two coats plus top coat for these photos. Look sharp on or off the beach with this light salmon pink neon (matte). I definitely need to fire my camera after photographing this polish! Bikini is actually a little less pink and more of a neon pinky-coral than these photos are showing. It was a little uneven with the first two coats, but it leveled nicely with a third coat. Photos shown are with three coats plus top coat. 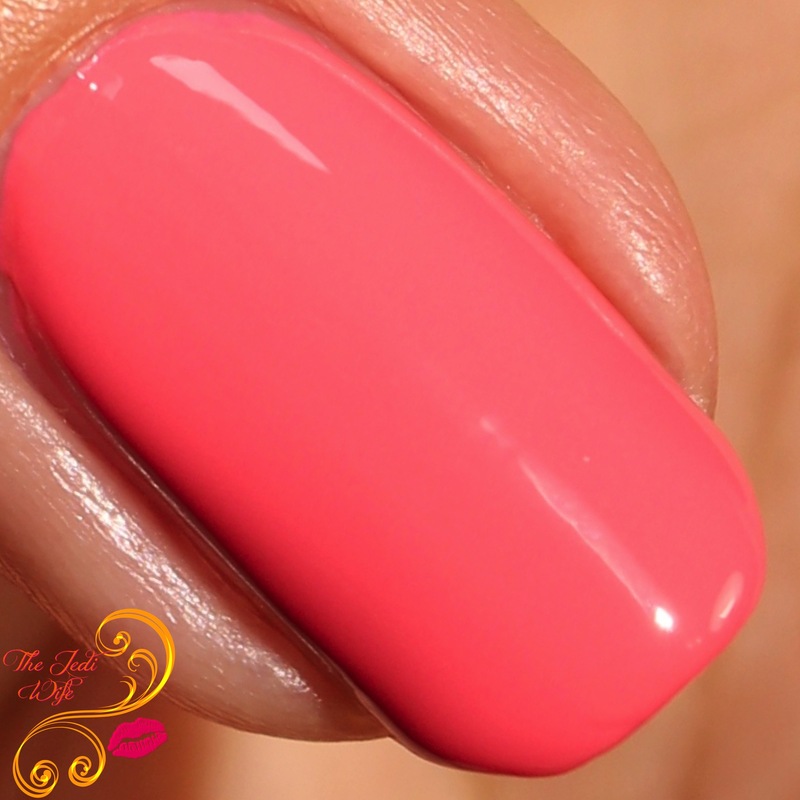 Julie's signature color, a lovely coral creme. I love coral polishes, especially this time of year, so Julie's Fave is also one of mine! This coral is of the pinker variety, so if you prefer the orange-leaning corals, this isn't quite for you. Of course you can always try something a little different and make this one of your favorites too! Shown with two coats plus top coat for these photos. From the Cruise Collection, Santorini is a periwinkle blue with a subtle hint of silver shimmer. While this isn't a colour I am generally fond of, I was pleasantly surprised by how much I loved this polish. The formula was fantastic to work with and I only needed two coats for opacity. I've also added top coat for these photos. Rio De Janeiro is a muted orchid creme from the Cruise Collection and another fabulous addition to the trio. I love the formula of this beauty, and I have it photographed above with two coats plus top coat. Some readers may find they need a third coat for opacity, and if so, it's well worth it! Enjoy poolside service with this attention-grabbing cobalt creme. Who says you need to have a pool to enjoy this beauty? Certainly not me! Between the gorgeous colour and superb formula, this is going to be a go-to shade for me this spring and summer! Shown with two coats plus top coat. This hot pink neon (matte) will have everyone saying OMG! Stay sassy with this amazing purple neon (matte) sure to keep you fierce AND fab! What another fabulous shade in this trio! I'm really feeling purple neons lately, and this polish will make you ROAR! The formula was on point and applied to opacity in three coats. Also shown with top coat. I am really loving these polishes! While some colours are a little patchy at first, they even out nicely with another coat. Even at the full price of $3.99 each, I think these are well worth it! It's even better when you pick up the trios for just $10 each (posted in the Special Offers section here)- not too shabby for a drugstore polish! This deal with end on May 31st, so if you're interested in picking up these trios and saving a little moolah, get those purchases in within the next five weeks! I'm not sure if these trios specifically will be available for purchase at Polish Con this weekend, but after my experience with the brand, I'm definitely eager to checking out what they have in store for everyone! If you want to try your luck, you might win a trio of your choice! Jesse's Girl is hosting a giveaway starting now until May 4th with four winners drawn. I've included the rafflecopter below for your convenience. Have you tried any JulieG polishes? Which ones are your favorite? Is there a trio you're hoping to win? I'd love to hear from you! Tropical is my favorite shade of the nine. It's so bright! I love this collection. Julie's Fave is my fave, of the bunch. The blues all jump out at me. I loved them the most. I love these sets. They are grouped together so well! Cabana Boy is the kind of blue polish that looks good on me - want! Gorgeous swatches! 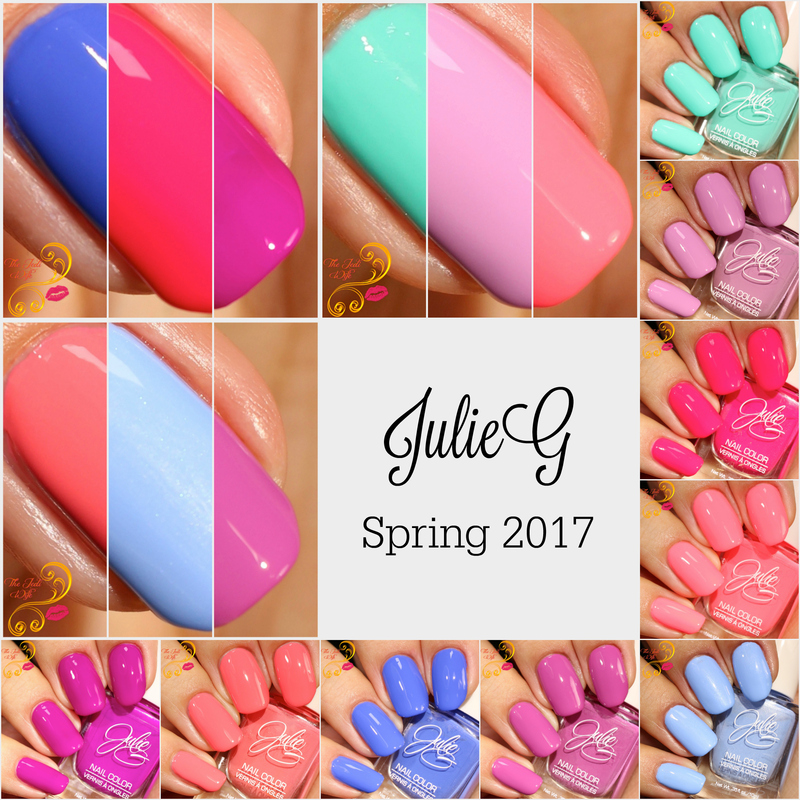 I'm in love with all of these spring/summer shades from JulieG! I haven't tried this brand before but these are really pretty. These are beautiful colors. I really love Julie G Beauty nail polishes!